OK. I will grudgingly agree. I did found something to like about middle earth (Alabama, to be specific). It’s a small slice of heaven but it deserves merit. Middle earth has a beach. And it is mighty lovely. In fact, more lovely than the beach in Southern California. I jest not. So, it went like this: Hubby came home from a business trip to Brussels and the next morning, after The Poodle was dropped off for his four-day play date with Cooper-the-Golden Retriever, we were on the road. It’s six hours to the Alabama coast from “middle earth”-Huntsville (nearly the same distance we drove regularly from Redondo Beach, California in Los Angeles County to visit my mother in Scottsdale, Arizona). Realizing that I’m still not happy about living in middle earth, I tried not to set my expectations too high. I’d spent eight years in Southern California…living two miles from the ocean enjoying near perfect weather, year round…..and….well…what could be better than that? I’ll tell you and reluctantly so….. 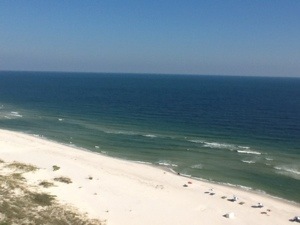 The Alabama coast (also known to some as the Redneck Riviera)! What’s different about the Alabama coast? I love the sand. It’s clean, a pristine white, and fine as sifted confectioner’s sugar kind of sand. And, when you walk on it there is this soft squeaking sound with each step. It’s squeaky-clean sand. 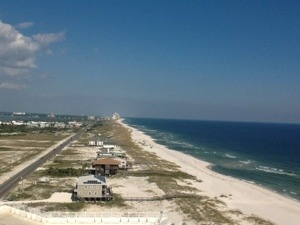 We stayed in a high-rise condo (the 14th floor) in Perdido Key, Florida. I’d have preferred a small beach cottage but it’s not quite like the Outer Banks, North Carolina here. Anyhow, just two miles westward up the beach you cross into Alabama. Hubby and I walked the beach just past the state line each morning and afternoon in our continuing effort to keep moving our aging (and expanding) bodies. What else is different about this beach? The water. I fully expected the frigid shock to the system when I dipped my toes into the ocean here for the first time. But the only shock I received was learning that the water is warm! Oh my…how absolutely lovely was my only thought as I sank myself into the warm waters and, for a half hour or so, I didn’t think much about the possibility of sharks. That’s how enthralled I was with the warm water. For inquiring minds, September in middle earth is the perfect time to enjoy the Redneck Riviera, particularly if you’re one that doesn’t want to be surrounded by throngs of partying college kids or caravans of families each with a car-load of kids and beach paraphernalia in tow. So far, we have spent two marvelously serene days on the beach staring out at the ocean, reading, or taking long walks. I’d spend the entire day in a beach chair if it weren’t for the fact that my fair complexion just cannot take the sun. I don’t know what God was thinking when he got around to me. No doubt my skin would be better off in the North Pole. No matter…it is my bliss time….and I’m soaking up every second of it. So I do my best to slather on sun-screen and savor this little slice of heaven…..